Varies depending on size of game. Usually around two hours. Warhammer: The Game of Fantasy Battles (formerly Warhammer Fantasy Battle and often abbreviated to Warhammer, WFB or WHFB) is an out-of-production tabletop wargame created by Games Workshop. It is the origin of the Warhammer Fantasy setting. The game is designed for regiments of fantasy miniatures. It uses stock fantasy races such as humans (The Empire, Bretonnia, Kislev), Elves (Dark Elves, High Elves, Wood Elves), Dwarfs, Undead, Orcs and Goblins, as well as some more unusual types such as Lizardmen, Skaven and the daemonic forces of Chaos. Each race has its own unique strengths and flaws; Wood Elves, for example, have the most powerful archers in the game but have poor overall defence and Bretonnia have the strongest cavalry but weak infantry. Similarly, the High Elves are very powerful in close combat, but have weak armour, and cannot be fielded in very large numbers. Warhammer has been periodically updated and re-released since first appearing in 1983, with changes to the gaming system and army lists. The current official version, the eighth edition, was released on 10 July 2010. Warhammer 40,000, a futuristic companion to Warhammer Fantasy Battle, was released in 1987. People gathered around a game of Warhammer. Warhammer is set in a fictional universe notable for its "dark and gritty" background world, which features influences from Michael Moorcock's Elric stories, Tolkien, the Cthulhu Mythos and also many historical influences. The geography of the Warhammer world closely resembles that of Earth because of manipulation by ancient spacefaring race known as the Old Ones. This mysterious and powerful race visited the Warhammer World in the distant past. Establishing an outpost, they set about manipulating the geography and biosphere of the planet. With the assistance of their Slann servants, they moved the planet's orbit closer to its sun, and arranged the continents to their liking. To travel between worlds, the Old Ones used portals to another dimension ("warp gates"), which they built at the north and south poles of the Warhammer World. Eventually, however, these gates collapsed, allowing raw magical energy and the daemonic forces of Chaos to pour fourth into the Warhammer world. At this point, the Old Ones disappeared. Before leaving however, they had established the Lizardman empire (ruled over by the Slann) as their servants. In addition they had created the races of Elves, Dwarfs, Humans, Ogres and Halflings. Orcs and Goblins were not created by the Old Ones, or part of their plan, and their origin is not made clear in the setting. Beastmen and Skaven were the result of mutation from raw magical energy at this time. Eventually the Chaos Daemons were driven back by Lizardmen and Elves, with the Elves performing a great ritual to drain out the raw magic that was flowing into the world and sustaining the Daemons. Some creatures, such as Dragons and Dragon-Ogres, are stated to have existed prior to the arrival of the Old Ones. After this, Elves and Dwarfs flourished and created mighty empires, but eventually they were set into a slow decline. A series of civil wars amongst the Elves split them into two groups - the malicious Dark Elves and righteous High Elves. A petty war between the High Elves and Dwarfs served only to diminish both races and caused the High Elves to abandon their colonies. Some of the colonists refused to leave their homes in a magical sapient forest and over time developed into the enigmatic and isolationist Wood Elves. A period of seismic activity caused by the Slann decimated the underground holds of the Dwarfs while attacks by Skaven and Goblins, who breached the Dwarf strongholds from below, only made things more desperate. The humans were the slowest to develop, but ultimately formed several strong nations able to defend themselves from aggressors. The Nehekharan Empire (based on Ancient Egypt) was the first great human empire, but due to a curse by Nagash (the first necromancer) they became an undead faction known as the "Tomb Kings" who now dwell in The Land of the Dead (former Nehekhara). Nagash, in his efforts to find eternal life, also created the first Vampires, an entirely separate undead faction. In the present time (according to the setting's fictional timeline) there are two prominent human nations: The Empire which is based on the Holy Roman Empire and renaissance Germany, and Bretonnia, which is based on Arthurian legends and medieval France. There are also numerous other nations which are not playable in the tabletop game. Sigmar, founder of The Empire, wielded a mighty Dwarf-made Warhammer from which the name of the "Warhammer Fantasy" setting is derived. The forces of evil are often depicted as not a localised threat, but a general menace. The Skaven exist in an "Under Empire" (an extensive network of tunnels beneath the planet's surface), while the war-loving Orcs and Goblins are nomadic (although they are most common in the Badlands, Southlands and Dark Lands) and regularly attack without warning. Similarly, Ogres are most common in the Ogre Kingdoms and in the eastern Mountains of Mourn, but are depicted as unscrupulous wandering warriors who are always hungry. In addition to the chaos-worshiping Warriors of Chaos who live in strange Chaos Wastes north of the other faction's lands, chaos cults often arise within human and elven nations. Beastmen are depicted as mutants dwelling deep in forests and impossible to fully eradicate. Vampires and necromancers raising armies of undead are also depicted often as an internal threat. Chaos Daemons are restricted to manifesting themselves where magical energy is strongest, but this could be almost anywhere. The 8th Edition Empire Army Book describes the Warhammer World to currently be in the year 2522 (Empire calendar), whilst the current Lizardmen Army Book puts the collapse of the warpgates at -5700 on the same calendar, thus the fictional history spans at least 8200 years. There are a number of playable armies for Warhammer, which are representative of one or other of the factions or races that are present in the Warhammer world setting. For the first few editions of the game armies were presented in collective books like Warhammer Armies. Starting in the 4th edition individual books were released for each army. Chaos Dwarfs: The White Dwarf Presents army book was released during 4th Edition as a collection of White Dwarf articles, but is still considered an official rule book. An official Chaos Dwarf army list was included in Ravening Hordes at the start of 6th edition. The army list was included in the reference section of 7th edition, but has been removed from the 8th edition rulebook. This model line was discontinued at the end of 5th edition and is no longer supported by the main rules. Forge World is releasing new Chaos Dwarf models under their new Warhammer Forge line. Rules for Chaos Dwarfs are expected in their first Warhammer supplement. Dogs of War: The official army book was released during 5th Edition; Regiments of Renown and Mercenary Army lists for 6th edition were released on the website. Some of this line remains available from direct order and is the only discontinued army for which models are still (As of 2013) available directly from Games Workshop. Kislev: The army book was given away free with White Dwarf magazine during 6th edition. This model line has since been discontinued and is no longer supported. The eight main Lores of the warhammer world are used by multiple armies and races, and are the only Lores available to Empire and Bretonnian armies. Dwarves do not use magic at all. While at least some of the eight main lores can be used by many armies of the Warhammer world many races have their own unique magical Lores. Throughout the eight editions of the game, the core movement, combat and shooting systems have remained generally unchanged, with only minor revisions between editions. The most significant changes which ensure incompatibility between editions have been made to the magic, army composition systems, and specialist troop types. The starter armies in the box sets have gradually grown more detailed with each succeeding generation, and the 7th edition (2006) was the first to be titled as a scenario ("The Battle for Skull Pass") instead of just Warhammer Fantasy Battle. Of the High Elves which have appeared in the 4th edition (1992) and 8th edition (2010), while the 4th edition only contained Spearmen and Bowmen figures (essentially, just two types of figurines) plus a cardboard cutout for the general, the 8th edition contains a more widely varied army (including cavalry, Sword Masters, mage, and a general mounted on a griffon). Published in November 1981 for its second edition (1978 for the very first one), and written by Richard Halliwell and Rick Priestley, Reaper is considered the ancestor of Warhammer Fantasy Battle. Reaper is more a skirmish game for up to 30 miniatures rather than a large-scale wargame. The first edition, written by Bryan Ansell, Richard Halliwell and Rick Priestley was published in 1983 and consists of a boxed set of 3 black and white books illustrated by Tony Ackland: Vol 1: Tabletop Battles, which contains the core rules, turn sequence, creature lists, potion recipes and features an introductory battle 'The Ziggurat of Doom'. Vol 2: Magic which explains rules for wizards of 4 different levels and the higher order arch magi. Higher level wizards have access to more powerful spells. In this system, a wizard picks his spells at the start of the game, must have the correct equipment (usually Amulets), and as he casts each one it depletes a store of 'constitution' points, until at zero points he could cast no more. Vol 3: Characters introduces 'personal characteristics' statistics, rules for roleplaying (including character advancement through experience points and statistic gains, random encounters, equipment costs, and alignment) and has a sample campaign "The Redwake River Valley". Very little world background is given at all and the race descriptions are kept to a minimum, and most of the background given is in describing the origins of magic items. Some notable differences to later editions are the inclusion of Night Elves (later Dark Elves), the appearance of Red Goblins - and that Citadel Miniatures order codes are given. Despite many rules inconsistencies, inadequate roleplaying rules, typing errors and poor presentation, the battle system was thought to be excellent and exceptionally simple and playable in comparison to other miniatures games of the time. The psychology rules - for determining how classic fantasy racial types behave towards each other - and the fumbling of magic were well regarded and thought to enhance the fantasy feel of the game and provide entertainment. The first edition was extended with Forces of Fantasy boxed set in 1984. In 1984 the second edition was released, incorporating some of the Forces of Fantasy material, White Dwarf articles and Citadel Compendium material. This was again a boxed-set of three black and white books (with colour covers). Combat explains the core rules and turn sequence; while Battle Magic largely retains the same system as the 1st Edition, as well as adding specialities of Illusionists, Demonologists, Elementalists, and removing the requirements for Amulets. The centre pages are an introductory scenario "The Magnificent Sven" for which cardstock figures were also supplied in the box. The Battle Bestiary book features descriptions of the races, monsters and includes several example army lists and a points system for players to develop their own open-ended armies. Also in the Battle Bestiary is the first appearance of the Warhammer 'Known World' along with a map, and a timeline which includes the Slann, Incursions of Chaos, inter-elf wars and The Empire. Minor rules modifications included rationalising all statistics to use numbers, and increasing all creatures' Strength by 1. Campaign packs produced were Terror of the Lichemaster, Bloodbath at Orcs' Drift (1985, referring to Rorke's Drift) and Tragedy of McDeath (1986, referring to Macbeth). The pack Blood on the Streets was card buildings for terrain. In 1987 the 2nd edition rules were expanded with the Ravening Hordes army lists which provided a more 'realistic' method of forming armies along stricter racial lines. The full boxset has a common value of around £100. The Third Edition of the game was published as a single hardback book in 1987. It had the most in-depth and complex movement and manoeuvre system of any edition. Other changes included a variety of new specialist troop types, rules for war machines and a more finely tuned system of representing heroes and wizards. It kept the same magic system and open-ended army design system as the first two editions. However, by this stage the use of army lists was very much encouraged. Army lists for this edition were published in a separate book called Warhammer Armies in 1988; until then, use of the 2nd Edition's Ravening Hordes list was encouraged. This is partly because it was the last edition published before Games Workshop took a different commercial approach, leading to competition from former GW employees in the briefly published competing Fantasy Warlord. The third edition was expanded with the Realm of Chaos: tome one, Slaves To Darkness, followed by tome two, The Lost And The Damned; and Warhammer Siege books. Aspects such as the 'fast-paced' rules system and developed fantasy background were highly praised, with negative criticisms reserved for the 'wordiness' of the text and that the images, rather than illustrating the text, were largely decorative. The main differences to the 2nd edition noted were the rules on routing, charging and less clarity in the presentation, subsequently making the rules more complex to learn and use. The fourth and fifth editions of the game, released in October 1992 and October 1996, respectively, were similar to each other but quite different from the third. Fifth edition in particular became known pejoratively as "Herohammer" because of the imbalance between the very powerful heroes, monsters and wizards in the game and blocks of troops which existed effectively as cannon fodder. Both editions of the game were sold as box sets containing not only the rulebooks and a variety of other play aids but also sufficient plastic miniatures to be able to play the game "out of the box". The rules underwent a re-write compared to 3rd Edition. A completely re-worked magic system was produced which was available as a boxed expansion set. Rather than selecting spells they were drawn at random and the magic phase was based on the play of these cards, making magic a bit like a game within a game. The magic system was further expanded by the Arcane Magic box set and the magic element of the Chaos box set. The fourth edition was also the first edition to enforce the use of army lists in the form of separate Warhammer Army books for the separate racial groupings. These books prescribed for each army a limited number of unit choices; specifying limits on the amount of points that could be spent on "characters", troops and monsters and so on. The books also included background on the particular army, illustrations and photographs showing models and have remained with the game though updated with the rules. The fifth edition won the Origins Award for Best Fantasy or Science Fiction Miniatures Rules of 1996. The magic system was reworked and re-released in December 1996 as a single box covering the magic for all the armies. The magic was "toned down" (WD204) with spell casting limited to the players' own turn. The multiple card packs of the Colours of Magic system was replaced by 20 Battle Magic spell cards but the Colour Magic spells were in the rule book for players to use if they wanted. Several boxed campaign packs were produced, Tears of Isha for example, gave a campaign for High Elves and included a card "building" to assemble. Likewise, the Orc and Goblin themed campaign Idol of Gork included card idols of the Orc deities Gork and Mork. The others were Circle of Blood (Vampire Counts vs Bretonnians), Grudge of Drong (Dwarves vs High Elves), Perilous Quest (Bretonnians vs Wood Elves). The fourth edition featured High Elves versus Goblins. The fifth edition, released in 1996, re-introduced the Bretonnian forces, which had been left out of the 4th edition, and re-worked the Slann heavily to create the Lizardmen armies. The sixth edition, released in 2000, was also published as a box with soft-cover rulebook and miniatures (Orcs and Empire). The Rulebook was also available for separate sale, hard-cover in the first printing and soft-cover after that. After the fifth edition, this edition put the emphasis back on troop movement and combat: heroes and wizards were still important but became incapable of winning games in their own right. There was also an all-new magic system based on dice rolling. The seventh edition rules were released on 9 September 2006. It was available in two forms: as a single hardback rulebook for established gamers and as a complete boxed set game complete with plastic miniatures (Dwarfs and Goblins), The Battle for Skull Pass supplement book and a soft-cover rulebook that has less artwork and background material than the hardback version. The smaller rulebook from the boxed set was approximately half the size of the large book both in size of the cover and page count. The "Basic Rules" and "Advanced Rules" sections of both books were identical in text, layout, illustrations, credits, page numbering and ISBN. The two books had different front pieces and the larger rulebook has two extensive addition sections "The Warhammer World" (68 pages) and "The Warhammer Hobby" (56 pages) plus slightly expanded appendices. 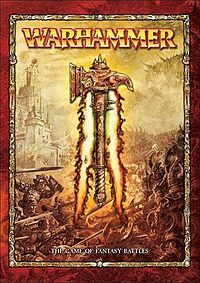 According to the official Games Workshop webpage, the 8th edition of Warhammer was made available for pre-order on 14 June 2010 and was released 10 July 2010. The new starter set named Island of Blood contains facing armies of High Elves and Skaven. A condensed mini-rulebook, as well as 10 standard dice, one scatter and one artillery die, two 18 inch rulers, and three blast templates are included in the box. On Friday the 23rd of July, Games Workshop began posting an "unboxed" series detailing the contents of the new game box called "A Blog of Two Gamers"
The first army to be introduced to 8th edition was Orcs and Goblins. They are one of the most popular Warhammer Fantasy armies, but their release in 8th edition was not totally expected, as at the time there were three (Dwarfs, Wood Elves, and Bretonnia) Warhammer armies released during 6th edition. The Dwarf and Wood Elf army books have since been replaced with newer versions. The 8th edition was extended with Storm of Magic 'supplement' in 2011 (an expansion that features rules for using more destructive magic and monsters). Another one was released, called Blood in the Badlands shortly afterwards (it included some special scenarios and introduced rules for siege warfare). In 2013 Triumph and Treachery (an expansion that allows multi-player games of between 3 to 5 players) and Sigmar's Blood (a 5 scenario short campaign between Empire and Vampire Counts following the crusade led by Volkmar to destroy Mannfred von Carstein) were released. Another series of five books saw the light in 2014-15 entitled The End Times. These books advanced for the first time the plot of the world of WARHAMMER and saw the appearance of every major character of the setting. The last book Archaon described the end of the The World of Warhammer. Warhammer Ancient Battles (often referred to as "WAB" and sometimes Warhammer Historical). Intended to simulate armies of the real world of the Ancient and Medieval periods. A science fiction based skirmish wargame using similar rules was developed as Warhammer 40,000: Rogue Trader by Games Workshop and released in 1987. Originally using a minor variation of the 2nd edition Warhammer Fantasy Battle rules, the two games have subsequently taken different development paths. This has since developed into the separate Warhammer 40,000 setting. The first edition of Blood Bowl uses the same basic turn system and character statistics as Warhammer to simulate a fantasy American football game. Rules for ranged combat applied to ball throwing. Since the second edition of Blood Bowl the game has taken its own development path. Games Workshop released a skirmish scale wargame set in the world of Warhammer called Mordheim. It is set in the destroyed city of Mordheim. It uses the same basic rules as Warhammer, but modified to support activation of individual models in a small gang. It also has a campaign system which you use to improve your warband as they gain experience. The Warhammer Fantasy Battles rules led to Warhammer Fantasy Roleplay in 1986, again using the same statistics, although presented as percentiles rather than 1-10 to give more detail and differentiation between characters than is required in a wargame. In 2005 Black Industries released a second edition and Fantasy Flight Games now owns the rights to the 2nd edition game. In 2009 Fantasy Flight Games discontinued active support for the second edition due to the release of the 3rd edition. "Dark Heresy" (another Role-playing game) was released by Black Industries in 2008 using a variation on 2nd edition Warhammer Fantasy Roleplay. The line was transferred to Fantasy Flight Games, which then released "Rogue Trader" (2009), "Deathwatch" (2010), "Black Crusade" (2011), and "Only War" (2013), each using close variants of the Dark Heresy engine. Games Workshop released "Judge Dredd: The Role-Playing Game" (1985) was clearly derived from the same percentile mechanics as Warhammer Fantasy Roleplay. "Inquisitor" is a detailed, percentage based miniatures game set in the derivative Warhammer 40K setting. The mechanics fall somewhere between Warhammer Fantasy Roleplay 1E and Warhammer 40K. Warmaster, representing very large-scale, epic battles. Warmaster uses smaller models than Warhammer using 10 mm as opposed to 28 mm, with different rules regarding troop movement and combat. In 1993, Games Workshop released a naval wargame set in the world of Warhammer called Man O' War. In 1990, Games Workshop released a strategic wargame of empire building, Mighty Empires, intended both as a stand-alone game and as a way to manage a campaign of miniature battles. Warhammer Fantasy Battle has been adapted as computer games: the 1995 Warhammer: Shadow of the Horned Rat, its 1998 sequel Warhammer: Dark Omen, Warhammer: Mark of Chaos and the MMORPG, Warhammer Online: Age of Reckoning which was released on 18 September 2008. On 1 October 2011, Games Workshop released the one-off game, Dreadfleet. Fantasy Flight Games' "Warhammer Fantasy Roleplay 3rd edition" is a new game engine not derived from the earlier game mechanics. It was released in 2009. Warhammer: End Times - Vermintide is an upcoming first person shooter game developed and published by Fatshark.